Beef Tenderloin is great. What about oven roasted beef tenderloin that’s been rolled and stuffed with garlic and horseradish? Well, that’s even better. And it’s a one pan dish that’s really quite easy to do. The trickiest part of the dish is butterflying open the filet. I could have taken a bunch of step-by-step pictures of how to do this, but I think it’s probably easier to check out the excellent culinary school material at OKChef. They have a number of excellent tutorials on how to butterfly meat. When cooking whole cuts of meat like this, I tend to approximate about 1/3 pound for every adult that will be eating. After trimming and cooking, you’ll be left with roughly a 1/4 pound piece, which is just enough if there are side dishes. If this is going to be a Guys’ Night and you’re really focusing just on the meat, kick that up to 1/2 pound per adult. You’ll want to use bold flavors in the stuffing because of the long cook times. The garlic, and the other ingredients, will mellow out quite a bit while in the oven for 45 minutes. Before you start your prep and get the beef out of the fridge, preheat your oven to 425 degrees and stick you cast iron pan in there to warm up. You’ll want the pan very well heated throughout so that it can get a great sear on the beef tenderloin before roasting. 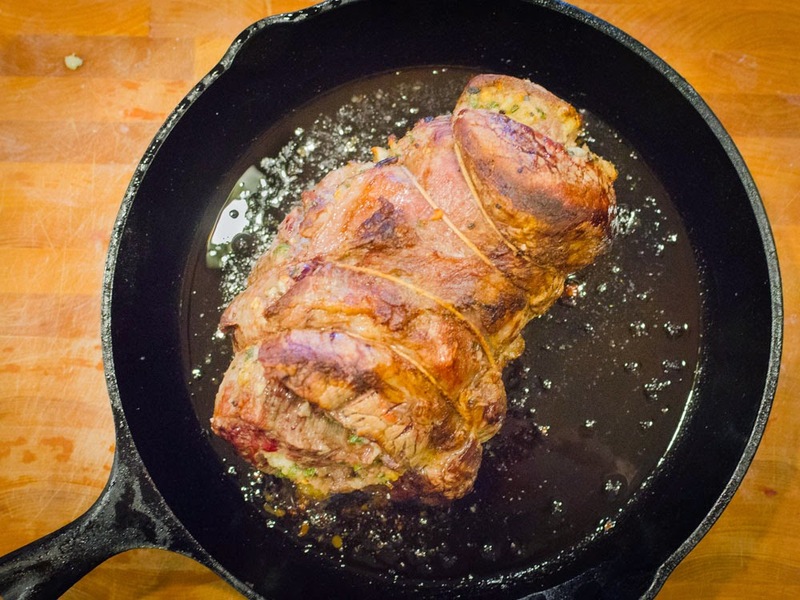 Next, use butcher twine to tie up the roast so that it stays together while cooking. If you’ve never done this before, then Chef Leonard can walk you through how it’s done. Your oven should now be up to temperature, so carefully take out the pan and put it over a burner set to hot. You’ll want to get your cast iron pan up to scorching hot to get a good sear. Once it’s ready, pour in a small amount of oil to lightly coat the bottom and place the roast in. About 2-3 minutes per side is all you need. This handy timetable for roasting meat will let you know when to start checking based on your desired outcome. For 2 pounds, I checked it at 40 minutes. Inserting a meat thermometer to the center, it was exactly 130 degrees. Keep in mind the temperature will rise as much as 10 more degrees while it rests. Keep an eye on the temperature, the worst thing you can do when roasting beef tenderloin is to overcook it. Remove the roasted beef tenderloin to a cutting board and tent with foil. Let it set for at least 10 minutes before slicing. As you can see below, the center piece was a beautiful medium rare. I served this with a very simple Parsnip and Leek Puree.